Backup, unfortunately, does not equal business continuity. That’s because while you are waiting to restore your backup, you aren’t effectively doing business. Business continuity means that your business goes on even your systems fail. Restores therefore are fast, and even when the system is down, continuity means you have still access to key pieces of business data. Hybrid cloud backup is one of the best ways to insure business continuity. Here you have a primary backup on premises, and an identical, synchronized copy in the cloud. Let’s say you have a fire in the building with the in-house backup. That exact same data is still in the cloud. 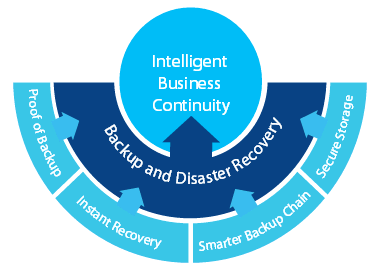 BluPointe has two bits of technology that provides not just disaster recover, but business continuity. First, BluPointe recovers online data at lightning speed. Even better, you can prioritize the data you want to recover. For instance, e-mail and the recent customer database files can be restored first, so fast you’d barely know they were missing. Older accounting files can come back once the essence of the business is back up and running. Service providers often use BluPointe as the basis of their business continuity solutions. Previder is one such provider. “Reliability of backup data is incredibly important to our customers. In any situation they need to be able to go back to a point in time to restore their critical data, to secure their business continuity. BluPointe helps in all situations and provides support when necessary,” said Eric Vredeveldt, Managing director at Previder. An BluPointe partner sees similar value. There is “a rolling window (typically 90 days) of back up is kept allowing almost instantaneous restores of lost or corrupt files, and the drudge of daily tape back-ups is eliminated, with archiving only being necessary at the end of the rolling back up window,” the partner explained.